My sister and I grew up hearing tales of our father’s childhood in a cabin in the deep woods of Upper Michigan. Grandma’s first husband was French Canadian, a Voyager perhaps, but of mixed blood. Our Aunt Vie would tell us interesting bits and pieces of her Indian heritage. Grandma herself was from Mackinaw Island where her family apparently had a long tenure. Our grandfather, Andrew, Grandma’s second husband, was one of three boys and part of an extended family group that had emigrated to the United States from Denmark in the late 1800’s. It was that amalgam of cultures, American wilderness pioneer, French Canadian, American Indian and Danish immigrants that provided a rich food heritage for my father, Lawrence, and his sisters Vie and Margie. We were taught those foods and methods but as everyday fare in a wilderness cabin. The source, the cultural influence, was however lost. Many years later, curiosity and a lot of study and research gave us insight into where the family foods had come from, their origin and how they were changed over time to adapt to new conditions and new influences. That being said, consider that cabin in the Michigan woods. Made of rough cut logs and clapboards it made for a snug retreat. There was a wood cooking stove against the far wall. Next to the stove was a small table with a washtub for a sink; that comprised the kitchen area of the cabin. Firewood was precious and it was mostly used for cooking. Any heat from the cooking stove that warmed the cabin was a bonus. Firewood was rarely used just for heating except only on the coldest of snowy winter days and then only sparingly. Once a week it was bread baking time. The stove was hot heating the oven and warming the house to insure the bread would rise. It was also a good day to open the trap door in the floor and pick out vegetables from the root cellar. There were, by all accounts we were told, turnips, rutabagas, carrots, broccoli, onions, potatoes, squash, pumpkin and maybe even some cabbage. With the oven already hot it was a simple matter to open pan roast the vegetables and let them be seasoned with drippings from the meat cooked on top. Although similar recipes appear in French provincial cooking few seem to be found in the present day American cooking. 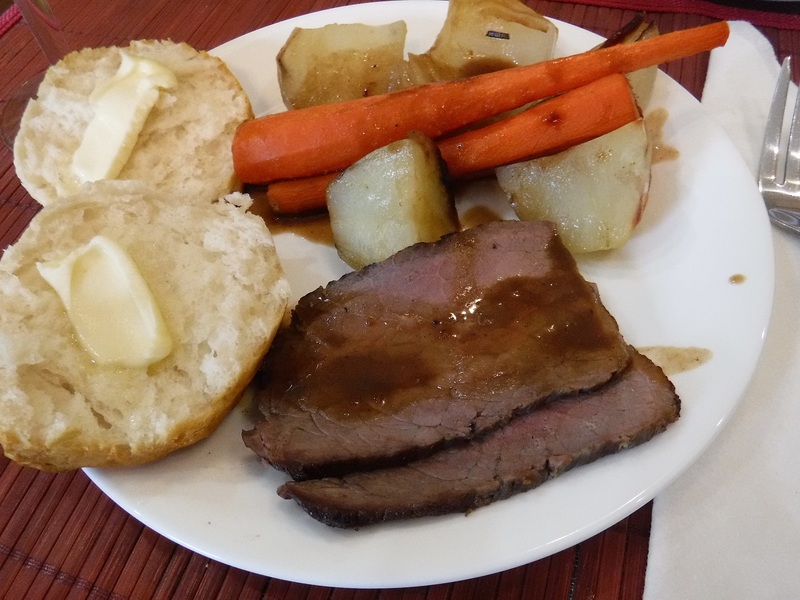 With this recipe I tried to capture a bit of that log fire roasted vegetables from the past and combine it with an oven roasted beef roast cooked tantalizingly rare. A wine reduction sauce added flavor to the mix. The above list is of the vegetables used in this presentation. You can use any of your favorite vegetables such as: turnips, rutabagas, broccoli, onions, squash, pumpkin and maybe even some cabbage to name a few. Mix marinade ingredients. 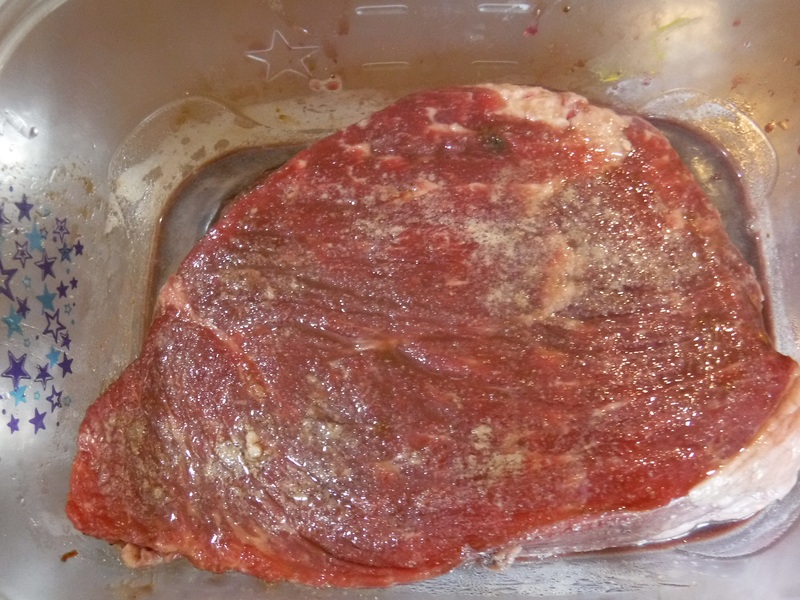 Place the roast in a large plastic bag and add the marinade. Gently squeeze the air out of the bag and securely close the bag opening. Marinate the roast in the refrigerator for at least four hours, overnight is better; turn frequently to cover all sides of the roast. Drizzle some olive oil on the bottom of your roasting pan. Heat on the stove top. 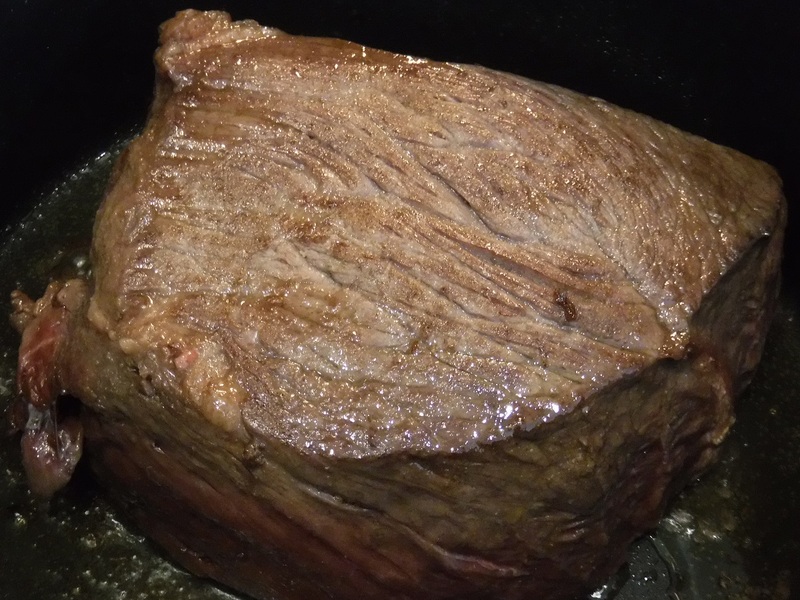 Brown the beef roast on all sides; remove from heat. Place the roast on a plate then add the marinade liquid to the hot pan. 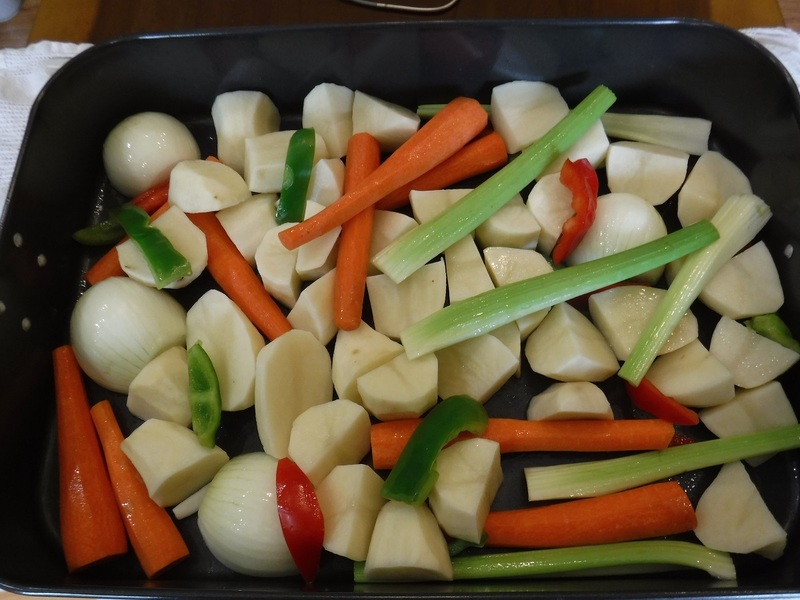 Place the prepared vegetables in the roasting pan. Season with salt and pepper. Drizzle with the ¼ cup of olive oil, toss to coat evenly. Put into a preheated 350° oven for 20 minutes. After twenty minutes remove the toasting pan and give the vegetable a stir to recoat with the oil and marinade. 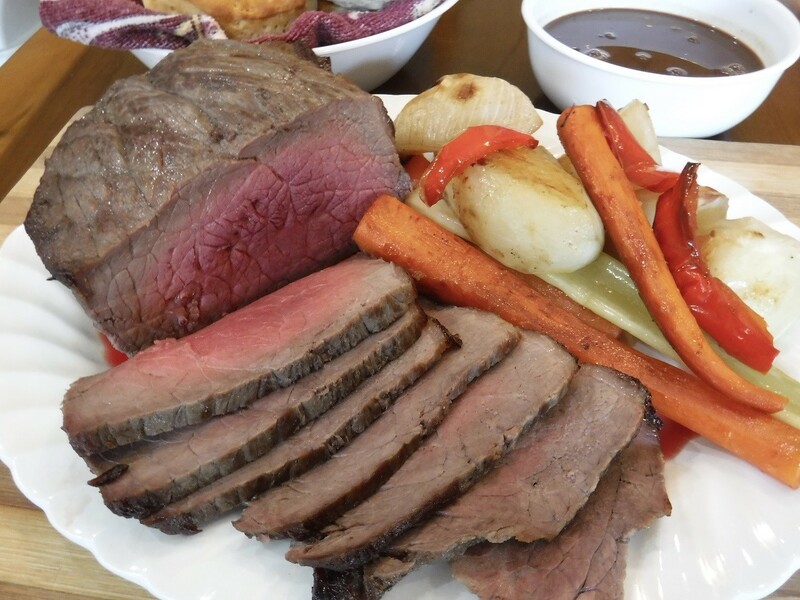 Place the reserved roast on the center of the vegetables with any dripping left on the plate. 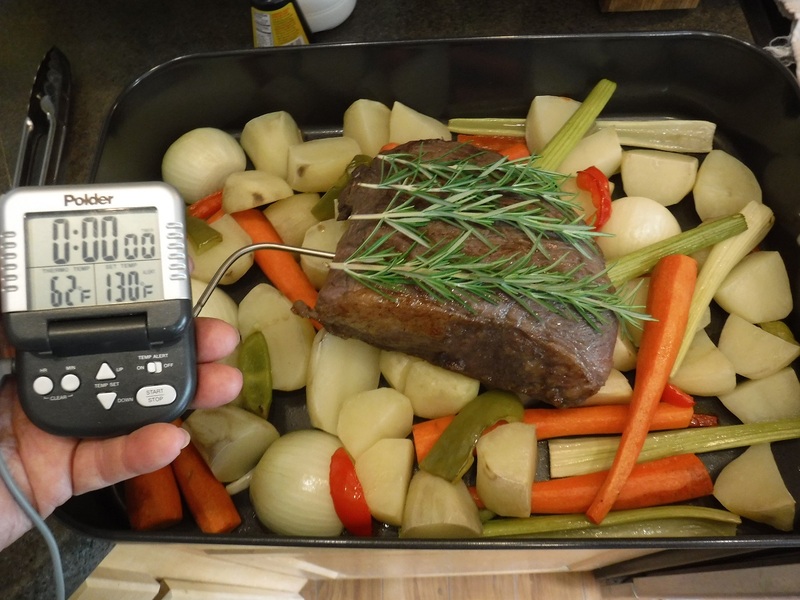 If using a thermometer insert into the center and set for the desired internal temperature. Add the rosemary spring on top of the meat.Return the pan to the oven and cook for one additional hour or until the thermometer alarms. When the meat and vegetables test done, remove to serving platter and bowl, cover with foil to keep warm and set aside. 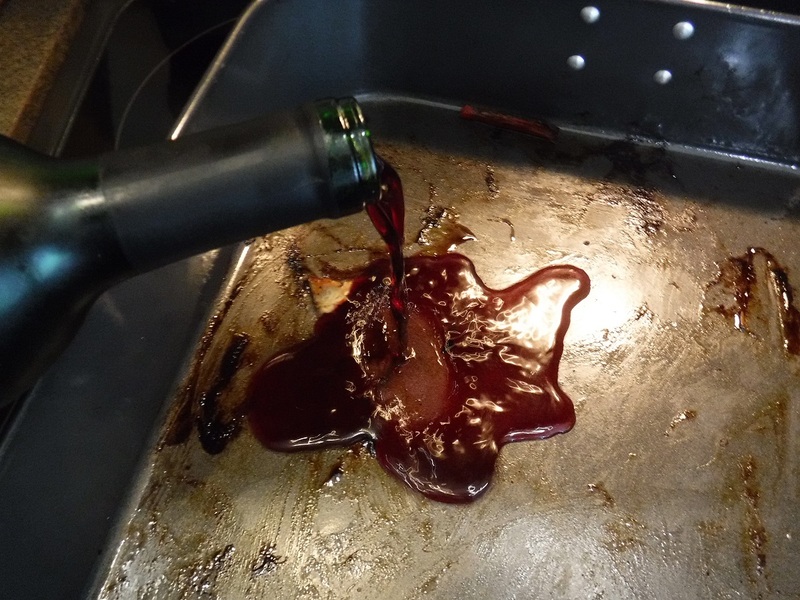 Place the roasting pan on the stove top and deglaze the pan with red wine. Add a generous dollop of butter and 2 cups of beef broth. Stir to mix well. Add 1 teaspoon of cornstarch mixed n 1 tablespoon of water. Continue to cook and stir and reduce the pan sauce to the desired consistency, a nice thick sauce but not so thick as a gravy. Serve with hot freshly baked biscuits and lots of sweet creamery butter; perhaps a bit of homemade jam on the side.